Spray 6-quart Instant Pot™ with cooking spray. Add broth to insert; place rack in bottom of insert. Place onion inside chicken cavity; tie legs with cooking twine. Pat chicken dry with paper towels. In small bowl, mix melted butter, thyme, salt, paprika and pepper; brush on chicken. Place chicken breast side up on rack. Secure lid; set pressure valve to SEALING. Select MANUAL; cook on high pressure 27 minutes. Select CANCEL. Keep pressure valve in SEALING position to release pressure naturally. Internal temperature in thigh should be at least 165°F using instant-read thermometer. If chicken is not done, select MANUAL and cook on high pressure 2 to 5 minutes longer. Select CANCEL. Keep pressure valve in SEALING position to release pressure naturally. When cool enough to handle, carefully transfer chicken to cutting board, and remove rack. Select SAUTE; adjust to normal. Heat liquid to simmering. In small bowl, beat cornstarch and cold water; stir into liquid, and cook 1 to 2 minutes or until thickened. 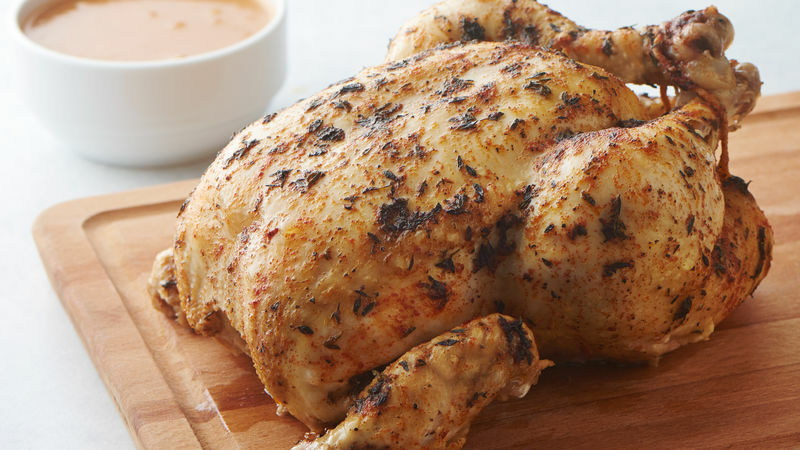 Carve chicken; serve with gravy. If crispy skin is desired, place carved chicken skin side up on foil-lined baking pan, and broil 4 inches from broiler element 3 to 5 minutes or until skin is crisp and browned. For extra flavor, use smoked paprika instead of plain. Larger birds may require a slightly longer cook time.